ArticlesArticlesIs Your Home Suffering From E.D.? 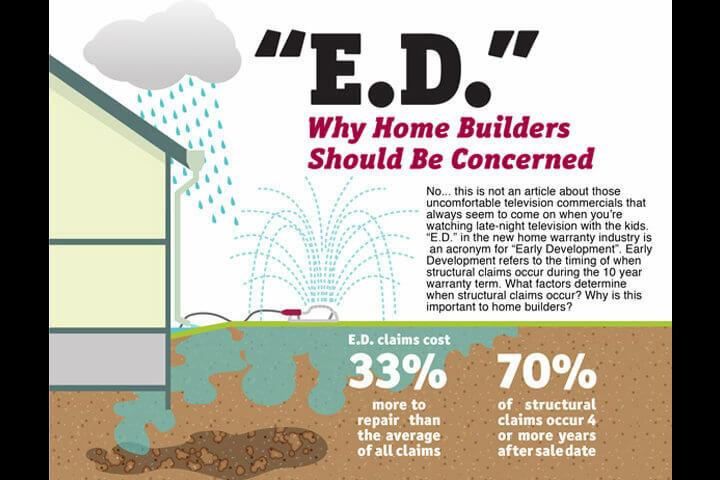 Over 70% of structural claims occur four or more years after the sale date of the home. 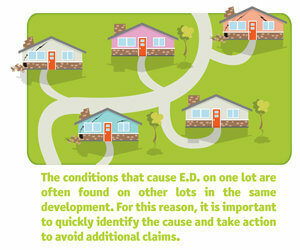 Claims that occur earlier than this are characterized as E.D., and are often a sign of a more severe problem. E.D. claims cost an average of 33% more to repair than the average of all claims. The timing and severity of claims is particularly important to home builders that maintain financial reserves to pay claims. The conditions that cause E.D. on one lot are often found on other lots in the same development. For this reason, it is important to quickly identify the cause and take action to avoid additional claims. Often, structural claims are caused by the performance of active soils on the foundation. As the water content of active soils changes over time, the soils swell causing heave, or shrink causing settlement. As the soils move so does the foundation. Typically, this movement is not uniform and causes structural defects, which become claims. The soil moisture content below foundations normally increases over time and can cause heave. The soil moisture increases since the natural upward migration of subsurface water vapor is cut off by the foundation. That is why when you turn over a large rock or log it is moist underneath. Soil moisture content can also increase due to over irrigation of landscaping and inadequate drainage away from the foundation. Soil moisture content can also decrease causing settlement. This is caused by abnormally dry conditions or drought. Settlement can also be caused by consolidation of improperly compacted fill material, collapsible soils or weak natural soils that contain excessive voids. 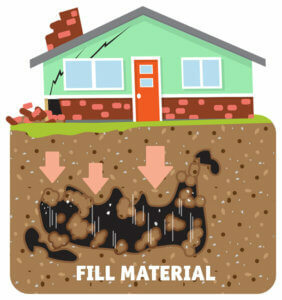 When the load of the house is placed on soils with voids, the voids can quickly close causing settlement. If foundation movement and related structural distress occur, it typically takes many years to develop. Early Development of structural claims is likely indicative of a significant drainage problem, severe over irrigation or improperly compacted fill material. For E.D. sufferers, make an appointment with your engineer to discuss your problem. Yes - It's Really FREE! Sign Up Now!